My mornings can be absolutely insane…I wake up…take a shower…. This is super easy and will give me a quick breakfast all week long. I customized mine to not have cheese (I’m on a cleanse where dairy is frowned upon… I know, ya gouda brie kidding me) but made a few for Steven with the cheesy gold. Make sure to do a brush of olive oil so nothing will stick. Then, layer the bottom with whatever veggie goodness you want: I went with spinach, some onions i quickly softened in a tiny bit of EVOO and some jimmy dean turkey sausage (the best vegetable of all). Scramble up some eggs and pour right on top. 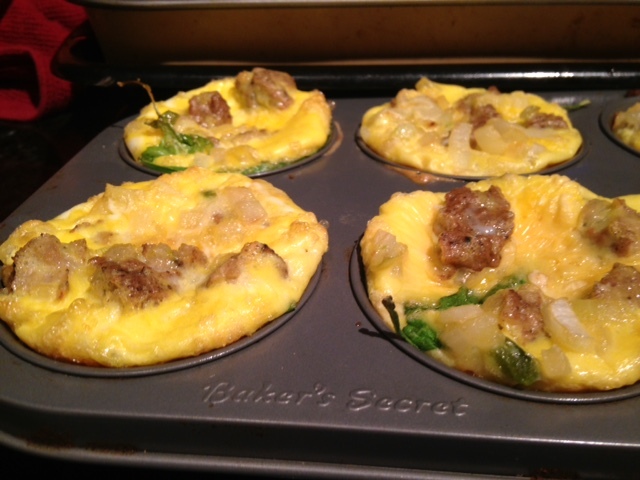 My muffin tins were about 1.25 eggs per tin but it’ll just depend on how much stuff you put in your egg-muffins. 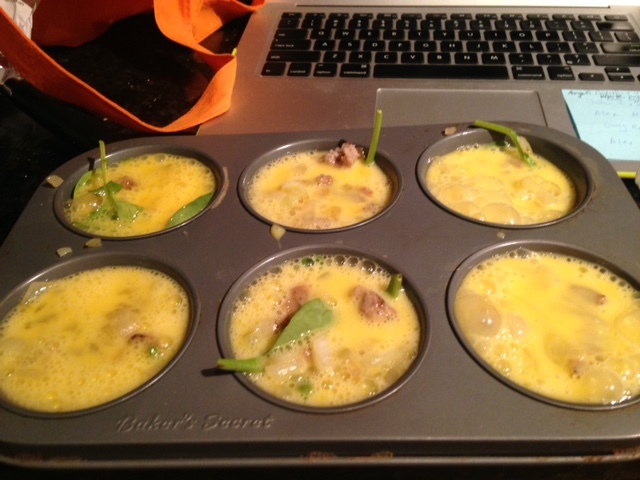 mmmm….egg-muffins. Throw them bad boys in the oven at 325 for 25 minutes and you got breakfast for the week! I’ll pair mine with some whole grain toast and when I’m off this cleanse, sirachaaaa. YUM. This is a great idea! Do you keep them in the freezer or fridge and how do you store them? Also, to reheat, is it just 30 seconds in the microwave? Thanks!